San Francisco: I get to drive a lot of new vehicles every year, maybe not one a week, but probably 40 or so a year. So it’s hard not to get jaded, or to think that every car, truck, and SUV I drive is great. Heck, when your personal transportation is a 1986 Toyota Celica even the most basic new car is pure luxury. But every so often a car comes along that just blows me away. The new 2007 Nissan Sentra that I drove was amazing. The Sentra used to be the least expensive, basic transportation car from Nissan. Now it is second from the bottom in price, but definitely near the top in usefulness, versatility, and fun. You may have seen the Sentra commercials on TV, the ones with Marc Horowitz living in his Sentra for a week. I did not live in the Sentra for a week but it really is that versatile. There is a caveat I must point out; the 2007 Sentra I drove was a pre-production version. What does this mean? Just that some of the trim may not have been fully sorted out but the basic package was there though. There has been some criticism over the styling of the Sentra; that it is too angular and not as flowing as other Nissans. So what? It is distinctive. It is edgy. Design is tricky. Designers have to work within very limited parameters. For a four-door sedan such as the Sentra, they have to worry about making five people comfortable. They have to find space for the powertrain package, and all the safety features, especially what are known as crumble zones. Then what good is a four-door sedan if it does not have any luggage room? Nissan's designers did an exemplary job with the Sentra (hey Marc lived in it for seven days). Let me say this, the Sentra is a roomy four-passenger sedan that will hold five. There is ample luggage room at 13.1 cubic feet in the trunk, which can be enlarged by folding the 60/40-split rear seat down too. There is only one engine available, a really nice 2.0-liter, DOHC, 4-cylinder that produces 140 hp and 147 lb-ft of torque. Two transmissions are offered, a 6-speed manual is standard, with a Constant Variable Transmission (CVT) optional except on the top of the line SL model where the CVT is standard. The Sentra I drove had the CVT trans and the Sentra is a front-wheel-drive car. One hundred and forty horsepower is not exceptional but these were frisky ponies for sure. Even more amazing is that as frisky as the engine is it is also very fuel-efficient. The manual trans is rated at 28-city and 34-highway, while the CVT is rated at 29 and 36-mpg. What else was amazing about the Sentra? How about that an economy sedan handled this well? The body platform had excellent rigidity, which provides a stable basis for the suspension to do its work. Trapped within this unassuming four-door sedan lives a sports sedan. The base wheel and tire package is a set of 205/60HR15 all-season tires on 6.5 X 15 inch steel wheels, unassuming but competent. Optionally available are 205/55HR16 all-season tires on 6.5 X 16 inch alloy rims that move the handling up a notch or two without degrading ride. There are three trim levels available, 2.0, 2.0 S, and 2.0 SL. The base 2.0 lists for $14,750, and the top 2.0 SL $18,400. I have become a big fan of the automakers consumer web sites. You can log on and build a car your way and see how much it will cost. 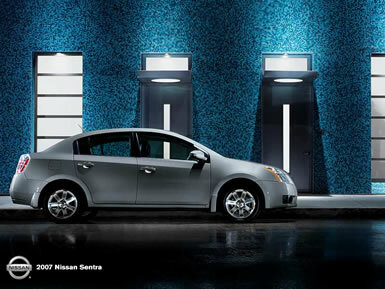 Nissan's site is www.nissanusa.com, which is where I went and built "my" Sentra. I started with a 2.0 S at $15,650 painted Polished Granite. I was going to stay with the 6-speed manual trans but opted for the CVT for economy. Then I picked the Convenience Plus Package (XM radio, ABS, 16 inch alloy wheels, plus) and floor mats; the price came up to $19,775 including destination and handling.